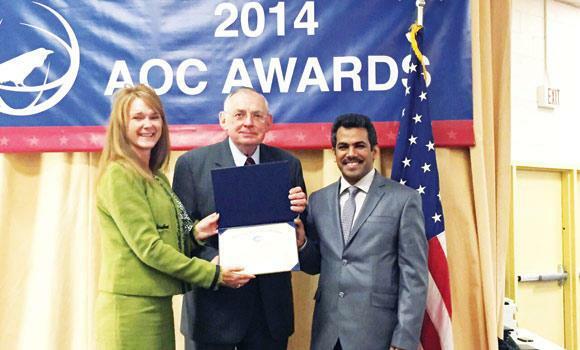 President of the local AOC branch Dr. Sultan bin Khaled Al-Moughi, right, receiving the award at a ceremony in Washington recently. The King Abdulaziz City for Science and Technology (KACST) has bagged two awards from the Washington-based Association of Old Crows (AOC) for its outstanding achievements in the practice of Electronic Warfare (EW). The Riyadh chapter of the AOC functions under the aegis of the KACST. The AOC is a not-for-profit international professional association with over 13,000 members and more than 200 organizations engaged in the science and practice of electronic warfare (EW), information operations (IO), and related disciplines. According to the president of the local AOC branch Dr. Sultan bin Khaled Al-Moughi, his office in KACST was adjudged the most active branch operating outside the United States. “The second award is for the remarkable increase in its membership from nine to 150 members during a period of 12 months,” he said. Al-Moughi, who is also the director of the National Center for Radar Techniques and Defense Systems at KACST, presented a scientific paper on “The importance of cooperation between research centers in the field of electronic warfare and their operational techniques” at the AOC annual conference which distributed the awards to the winners. Recently, KACST in collaboration with the Ministry of Defense organized the AOC 3rd Symposium for electronic warfare and accompanying exhibition at its headquarters in Riyadh. The symposium stressed the importance of electronic warfare, reviewed the latest developments in the field as well as its crucial role in defense. It pointed out the EW’s continuous progress and accelerated advancement that requires consolidating efforts to keep up with opportunities, threats and countermeasures. Prince Turki bin Saud, KACST vice president for Research Institutes, asserted that the accelerating and giant advancements in armament systems, communication and information technologies have led to a rigid challenge for EW systems which necessitates keeping pace with these advancements whether in systems of electronic support, electronic defense or electronic attack.